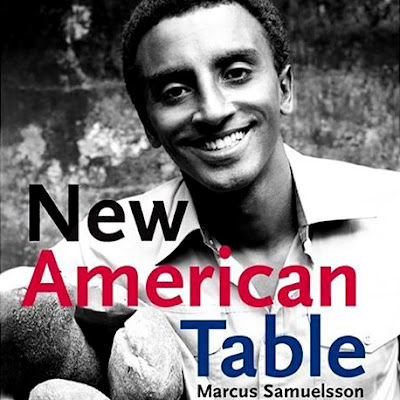 Everyone knows Marcus Samuelsson's story by now. Born in Ethiopia, adopted and raised in Sweden, ventured to America to train, but stayed to find his fortune. With such a varied background, one can see how his take on the "American" table might be just a bit different than most. Samuelsson is rather obsessed with the immigrant experience and that intense interest is displayed in The American Table. Samuelsson draws recipe inspiration from the vibrant ethnic cultures he sees in New York and beyond. In this book one can find green salsa, breakfast burritos, salmon flatbread, doro we't, tempura crab, soy-glazed dumplings, garlic feta dip, turkey meatloaf and the list goes on. While it is a bold way to look at cuisine in America, it makes for a bit of a disjointed cookbook. If you are looking for international ideas, this is the place to go, even if the title is a bit misleading. If you are looking to plan an entire dinner, this might not be the best fit. From a personal standpoint, recipes with dozens of ingredients are often off-putting, and Samuelsson loves long lists of ingredients that might be easy to find in New York City, but in most places, putting together one recipe will require a bit of specialty shopping. If you are undaunted, check out his veggie soup. I love orzo and feel it is one of those ingredients that needs to be used more. 1. Bring 3 cups salted water to a boil in a medium pot. Add the orzo, and cook until al dente, about 7 minutes. Strain, and set aside. 2. Heat the olive oil in the same pot, over medium heat. Add the onion, chile powder, ginger, chiles, garlic, and mustard seeds, and saute until the onion is softened, about 5 minutes. Add 4 cups water, season with the salt and white pepper, and bring to a simmer. Stir in the miso, mirin, and soy sauce and simmer for 10 minutes. Add the spinach, tomatoes, scallions, avocado, lemon juice, cilantro, basil and orzo, and simmer until heated through. I, of course, feel a ham hock would be a great addition to the ingredients list, but that's just carnivorous old me.